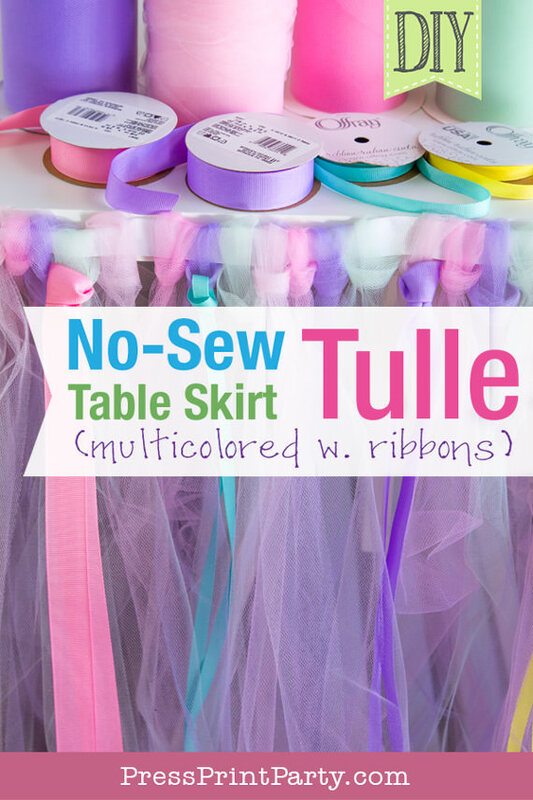 No-Sew Tulle Table Skirt Tutorial w. ribbons (EASY) - Press Print Party! Made with pinks, purples, greens, and yellows it just screams unicorn party! But change the colors to blues and create the perfect decor for your mermaid party. 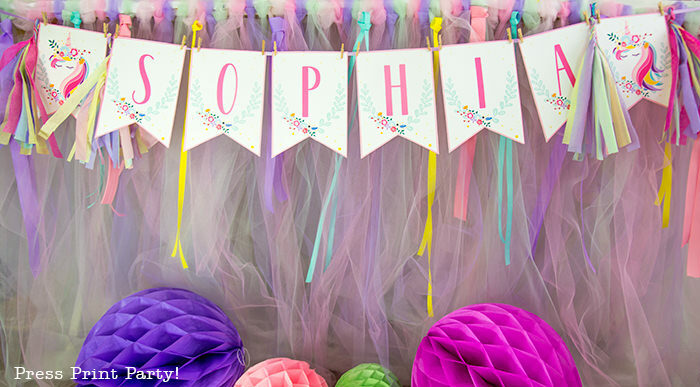 Use pinks, and you have the makings of a princess party. 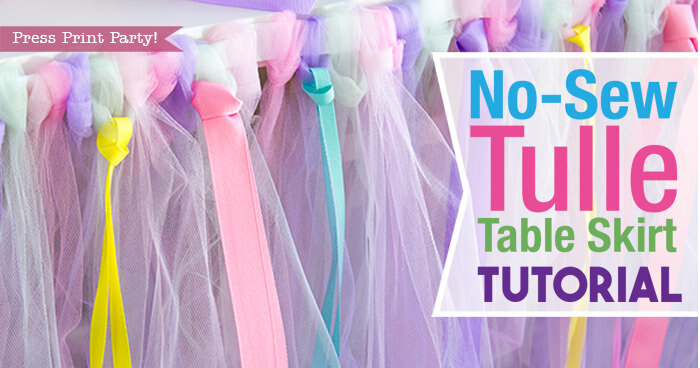 Tulle table skirts are also amazing as baby shower decorations. Now that I’ve got your creative juices flowing let’s get on to the details. I used rolls of tulle I bought on Amazon because they were a better deal per yard than at the store. You’ll need to measure your table and count about 2 yards per inch, more if you want a fuller skirt. So my table was 5 feet across and I used about (5x12x2) 120 yards of tulle in all. Divide that by the 4 colors I chose and you have 30 yards of each. The rolls I got were 100 yards so I have a lot left over and could have done the 2 sides also. I chose dark pink, light pink, purple and mint. 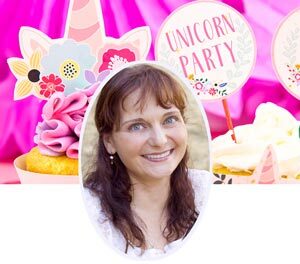 to match the unicorn party printables colors. 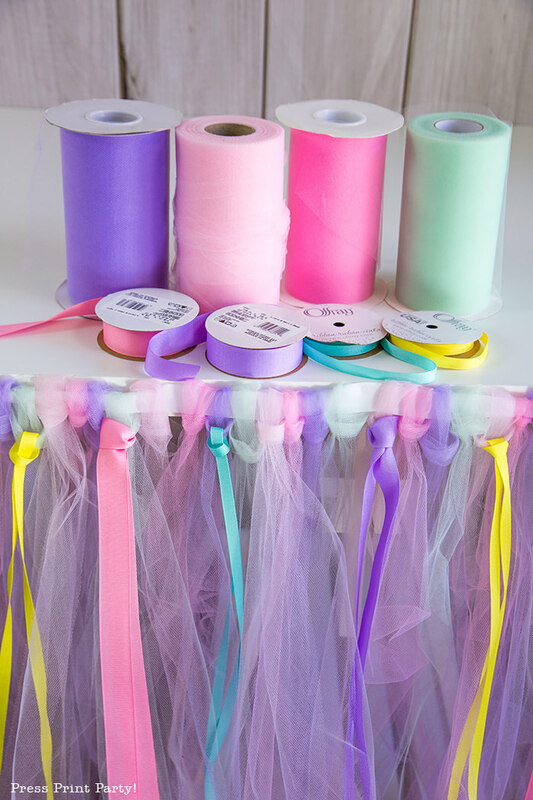 Choose colors that will compliment your tulle colors so they pop out as fun bursts of color. I got 1 roll of pink, yellow, turquoise, and purple in different sizes. And 1 roll of 1″ wide white fabric ribbon. We’ll use the white as the ribbon we’re going to string the tulle to. I LOVE U-glue rolls. I use them all the time to attach things to the wall for parties. The adhesive is strong but removes easily without any damage. You’ll need as many feet as the width of your table. My table was 5 feet so I used a whole roll. You could cut pieces and place them 2-3 inches apart if your table is wider and you didn’t want to buy another roll. If you’re attaching the tulle skirt to a tablecloth, the tablecloth must be very securely attached to the table (U-glue…… oh yeah!). Or heavy items must already be on the table. Otherwise, the weight of the skirt may make the tablecloth sag. Measure 2 yards of tulle and cut. String the loop on the white ribbon. I kept my loops loose so they would look rounder and fuller. Attach the skirt to the table using the U-glue or the pins. Cut different lengths of ribbons. 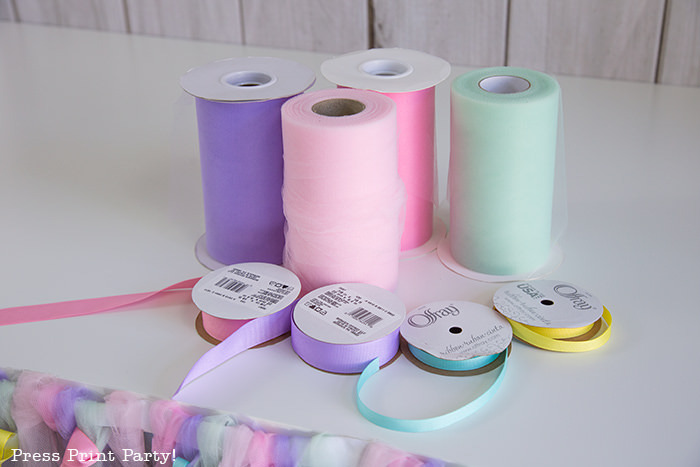 Fold in half and loop them in a random fashion to the loops of the tulle. The video shows how easy and fast this can be. Don’t forget to subscribe to my YouTube channel and get the all the latest DIY videos first. How do you make the loop? I show how to make the loop in the video. How did I not know about these U-glue rolls!? I adore glue dots but am definitely going to have to stock up on a few of these babies!! Such a cute detail to add the ribbon. Love how easy this is to dress up a table and after watching the video if doesn’t looks as time intensive as I thought it might. U-Glue is the BEST! Such a great product. Thanks for the compliment! This is great, I’m all about no-sew! I love to sew but I’m always too lazy to get the machine out of the closet! I love the no sew table skirt! The colors are so pretty and it looks easy to do! Such an easy way to decorate and so pretty!! Thank you. 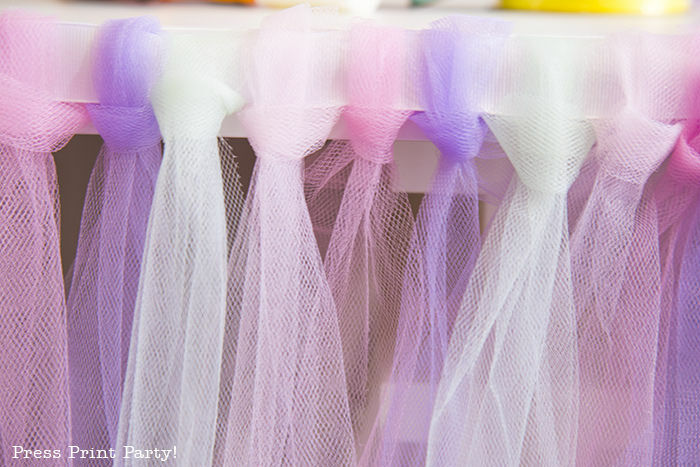 Tulle adds so much elegance to a party! This is so pretty and dainty!! Great idea that would work for so many themes!